Tuesday was another chapter of disappointment in the ongoing “process” that is Ana Ivanovic’s tennis career. That probably sounds harsher than I intend it to. There were positives to take away from her fourth round match against Victoria Azarenka. (That’s something, because often there aren’t) She hit 41 winners, and in the first set played the aggressive tennis that at once got her to the top of the game. She moved well too, possibly better than she’s moved in her entire career. But still, Azarenka was far below her best level, the match was there for the taking, the breakthrough that she has been working for was seemingly in her hands, and yet she still walked away as the loser. Last year at the US Open, Ivanovic made her first major quarterfinal since she won the the French Open in 2008. She hasn’t been back to one since–she’s fallen in the fourth round in three of the last four majors. She is currently ranked No. 15, which is certainly nothing to sneeze at, but she hasn’t been back in the top 10 since her French Open victory points fell off the following year. I feel like we’ve all just kind of accepted that this is the status quo for Ivanovic now. She’s no longer the player that she once was. But, I mean, what in the world happened? First of all let’s go to where all great investigations begin: Wikipedia. Ivanovic first picked up a racket at the age of five after watching Monica Seles, a fellow Yugoslav, on television. She started her career after memorizing the telephone number of a local tennis clinic from an advertisement. During the NATO bombing of Yugoslavia, she was forced to train during the morning to avoid bombardments. Later, she admitted that she trained in an abandoned swimming pool in the winter, as no tennis facilities were available. When she was 15, Ivanovic spent four hours in a locker room crying after a defeat – the first that her new manager had witnessed. She thought that Dan Holzmann, the manager in question, would abandon her, thinking her not good enough to become a professional tennis player. He has remained her manager to this day. Okay, so that’s quite the interesting backstory. We all knew about the swimming pool, of course, but the other anecdotes are very revealing. She was clearly very determined and, well, emotional about her tennis. 2004, Age 16: She began the year ranked No. 705. Went 26-0 on the ITF circuit. That fall, she qualified for Zurich, took out No. 29 Tatiana Golovin in a third-set tiebreak, and then forced No. 11 Venus Williams to two tiebreak sets before falling in the R16. Her next tournament, she made her first WTA QF in Luxembourg. She ended the year in the top 100, where she has remained for the last nine years. 2005, Age 17: She began the year ranked No. 97, and won her first title right off the bat, qualifying for and winning the WTA event in Canberra. She played in her first main draw of a Grand Slam in Australia that year, and made it to the third round before losing to No. 2 Amelie Mauresmo. She made her first Premier quarterfinal that year in Miami, taking out No. 12 Nadia Petrova and No. 7 Svetlana Kuznetsova before falling to Mauresmo in straights. Then she made the semis in Warsaw, taking out No. 10 Vera Zvonareva before falling to Justine Henin in a tight match. She made her first major quarterfinal in only her second slam appearance at the French Open that year, beating Mauresmo in the third round and Francesca Schiavone in the fourth round. She eventually lost to Nadia Petrova in the quarters. She finished the year with back-to-back semifinal performances in Zurich and Linz. She won one title and beat three top 10 players. When she was 17. 2006, Age 18: She began the year ranked No. 16. She had a steady, but not spectacular first half of the year. Highlights included taking out No. 3 Mauresmo in the second round of Sydney, making the quarterfinals of Indian Wells, and making the fourth round at Wimbledon. She had bad luck in the US Open that year, drawing then-No. 91 Serena Williams in the third round, but she finished the year in the top 15. She won one title and beat two top 10 players. 2007, Age 19: She began the year ranked No. 14. She didn’t do much until she got onto clay, which is where she really announced herself as a force in the game. She won the title in Berlin, taking out No. 4 Svetlana Kuznetsova in a third-set tiebreak. Then she went on to burst through to the French Open final. It was only her second time making even a Grand Slam quarterfinal in her career. On her journey she took out No. 3 Kuznetsova and No. 2 Sharapova before falling to No. 1 Henin in the final. And almost more impressively, she then made the semis of Wimbledon on her worst surface, taking out No. 9 Nadia Petrova and No. 10 Nicole Vaidisova before falling to Venus. She followed up that run by winning the tournament in Los Angeles. At the end of that period, her ranking was No. 4 in the world. In just three months she went 23-2, won two titles, made the final of the French and the semis of Wimbledon, and took out seven top 10 players. At her first WTA Tour Championships that fall, she made the semifinals before falling to Henin. She beat 13 (!) top 10 players and won three titles. 2008, Age 20: She began the year ranked No. 4. She made the final of the Australian Open, taking out Venus and Hantuchova along the way. Later that spring she became the No. 2 player in the world and won Indian Wells. She then made the semis of Berlin and lost in the first round of Rome to Tsvetana Pironkova, before seizing the day and winning her first Grand Slam at the French Open that year and becoming the No. 1 player in the world. Justine Henin had retired. Maria Sharapova was out with a shoulder injury that would take her years to recover from. Ana Ivanovic was the new face of the WTA. Top seed Ana Ivanovic of Serbia withdrew from the Olympic tennis event on Sunday with an injury to her right thumb. “This is one of the hardest moments of my career and one of the hardest decisions I’ve had to take,” 20-year-old Ivanovic told a news conference at the Olympic Tennis Center. Ivanovic, who will be replaced by fellow Serb Jelena Jankovic at the top of the world rankings on Monday, said she had not been able to practice since arriving in China. The French Open champion was due to play Mariya Koryttseva of Ukraine in the first round but said she would go home “in a day or two” to try to recover in time for the U.S. Open. Ivanovic said she suffered the injury when she returned to practice following a two-week break after her disappointing showing at Wimbledon where she lost in the third round. “I’ve tried everything to recover and I’ve had more treatments in 10 days than I’ve had in my life,” she said. The injury, which Ivanovic described as inflammation of the carpal-metacarpal joint, casts doubt over her participation at the U.S Open which starts later this month. She came back at the US Open as the No. 1 seed, but she fell in the second round to a qualifier, No. 188 Julie Coin. She lost early in her next four tournaments, before she finally stopped the bleeding a bit by defeating two top 10 players to take the title in Linz at the end of the year. She was No. 4 by the time the WTA Tour Championships came around. She lost two matches before withdrawing with a virus. She won three titles and beat seven top 10 players. 2009, Age 21: She began the year ranked No. 5. She failed to defend her Australian Open finalist points, falling in the third round to No. 31 Alisa Kleybanova. She then parted with Sven Groeneveld and started working with Craig Kardon. She made it back to the finals in Indian Wells, with a generous draw where she didn’t have to face a player ranked higher than No. 15. But she lost a terrible and windy final to Vera Zvonareva, and then she failed to win back-to-back matches until the French Open. There, she made the fourth round before falling to No. 9 Victoria Azarenka in straight sets. She dropped out of the top 10 then, and hasn’t been back since. She parted ways with Craig Kardon, and decided to go back to the Adidas Player Development Program, to work with Groeneveld, among others. She made the fourth round of Wimbledon, but then retired against Venus, and then didn’t win back-to-back matches all year. Citing a virus, she called her season a wash after Tokyo in the fall. She didn’t win a title or beat a player in the top 10 all year. She paired up with Steffi Graf’s former coach Heinz Günthardt in the spring on a trial basis. She went on a four-match losing streak, including Fed Cup and Indian Wells, and saw her ranking drop down to No. 58 in the world. Ouch. She had her best tournament since Linz 2008 in Rome, taking out two top 10 players–Azarenka and Dementieva–before falling in the semis to MJMS. However, she went into the French Open–the tournament she had won just two years prior and the cite of her No. 1 ranking–unseeded, and lost 6-3, 6-0 to Kleybs in the second round. But–she found some form that summer in Cincinnati, making the semis–including fighting back from a set and a break down to take out Azarenka in the first round. She withdrew due to a foot injury against Clijsters in the semis, but was fine for the US Open, where she made the fourth round before again falling to Clijsters. She won Linz and Bali to finish the year in the top 20. However, she ended her coaching partnership with Günthardt due to his TV commitments. She teamed up with Antonio van Grichen on a trial basis during the offseason. She won two titles that year and beat three top 10 players. 2011, Age 23: She began the year ranked No. 20. She strained her ab muscle in Hopman Cup, and then lost in the first round of the Australian Open 3-6 6-4 10-8 to Ekaterina Makarova. She stopped working with van Grichen then, and went back to the ADPD. She made the quarterfinals of Indian Wells, taking out No. 6 Jankovic along the way, and then she went to Miami. In Miami, she led Kim Clijsters 5-1, 0-40 (on Kim’s serve) in the third set. She lost the match. That was the first of what would become a pattern–those rare days that she was playing close to her top level, she just would not be able to close things out. She lost in the first round of the French Open, 7-6 (3) 0-6 6-2 to Johanna Larsson. She had a great draw at Wimbledon and cruised through the first two rounds, but then she lost 6-2 7-6 (0) to Petra Cetkovska in the third round. After that, she announced that she was joining forces with Nigel Sears. The rest of the year was steady but unspectacular, until, once again, Bali saved the day at the end of the year. She won one title and beat two top 10 players that year. 2012, Age 24: She started the year ranked No. 22. This year wasn’t totally depressing. She found some form with Sears by her side. She made the fourth round of Australia where she lost to Kvitova. She made the semis of Indian Wells, where she had to retire against Sharapova in the semis, and then she lost to a resurgent Venus in Miami. She lost in the third round of the French, the fourth round of Wimbledon, and that summer she FINALLY made it back to a Grand Slam quarterfinal–her first since the 2008 French–at the US Open! She lost to Serena in the quarterfinals, but she didn’t embarrass herself. She got back into the top 15 for the first time in three years, and ended the year strongly, taking out Kvitova in Fed Cup. But overall, she won no titles and beat three top 10 players that year. 2013, Age 25: She started the year ranked No. 12. I’m not going to go into depth on these results, because they should be fresh in your mind, you fools. She made lost to Radwanska in the fourth round of the Australian Open and the French Open, and then she crashed out to Genie Bouchard in the second round at Wimbledon. After Wimbledon, she announced that she was splitting with Nigel Sears and–you guessed it–going back to the Adidas Player Development Program. Her good tournaments have been Madrid and Carlsbad, where she made the semis in each. Okay, so, where does all of this leave us? And why in the world did I basically just re-type her wikipedia page? The answer to the former is much more complicated than even 2,500 words can express, although I can make my inferences, because I guess without it this whole exercise is even more futile than it seems. There is no doubt about the fact that Ivanovic has an insane amount of raw talent. It seems like when she was young, she decided that tennis was going to be her life–her ticket out of the swimming pool, if you will. She was determined and motivated, and luckily her see-ball, hit-ball game worked well when combined with youthful exuberance and naïveté. She didn’t know at the time how often the ball could go out, how glaring the spotlight would be at the top, or just how much work it would take to stay at the top. I talked to Donald Young during U.S. Open qualies–yes, I am bringing up Young in a story about Ivanovic, bear with me–and we talked about the one year he had success, back in 2011 when he got into the top 50. He talked about how it was much easier to get up to the top 50 than it was to stay there. He said (and I’m paraphrasing, sorry) that when he was climbing up the rankings everyone was so positive, he had so much confidence, and good things just kept happening. Every single win was something to savor, something to applaud. But then once he was there, it was much harder. He had some time to think about what he achieved, others knew he was playing well again, and then all of a sudden he panicked a little bit. In short, defending was a lot harder than earning. Staying there was a lot harder than getting there. I can’t help but wonder if this is a smaller-scale version of what happened to Ivanovic. I mean, I don’t know if she ever had a gritty champion’s mentality the way that Serena, Sharapova, or even Azarenka does. I’m not sure she enjoys the “suffering” or loves to “dig deep.” I don’t feel like she “has to win.” That’s not meant as an insult–just an observation. At the top, everything you do is under a microscope. The pressure never goes away. The target never gets an off-day. She might have been built for the climb, but not the view from the top. I think that Ivanovic is still good at tennis. That much was apparent if you watched the first set and a half of her match against Azarenka. But to get any higher than the 13-25 range that she has settled into the past couple of years, she’s going to have to somehow recapture the carefree mentality of her youth … and I don’t necessarily see that happening. I think it’s shocking to look back and see how good she was from 17-20. I mean, her seasons now are pretty much comparable to the seasons she had she had when she was 17/18. It’s hard to imagine someone 20 and under accomplishing what she did, but it’s even harder to comprehend that she hasn’t gotten anywhere close to those levels since. I think it’s quite possible that the momentum she lost due to the thumb injury, and the fitness she lost during that time period, ruined her career. With more and more players finding success later in their careers, it’s hard to imagine counting her out completely at the age of 25–especially since she seems to at least be playing the top players a bit closer the past few months. But it’s going to take something fairly drastic to turn around this plateau. The good news is that she’s stabilized in and around the top 20, so as to not completely embarrass her lucrative sponsors. The bad news is that these days, no match is a given–she’s not really a threat to any of the top players, but it feels like every player is a threat to her. She’s a nice girl. She’s not very mentally tough. She works hard and keeps coming back for more. An wonderful and much needed write up – I feel Ivanovics fall is one of the more shocking examples of form fluctuation and the dangerous, and quite funky, psychology of tennis. Its weird to me that no one is examining how she could soar so high and then fall so (consistently) low – this plateau you speak of. Unlike her compatriot Jankovic, who I feel has a more defensive game that relies much more on fitness, Ana has the power to outhit everyone – I just don’t know why she doesn’t. Watching her play now is slightly painful to fan, not only because she loses but because of the way she loses, combined with the awareness of what she is capable off. I guess its like that for every fan whose fav starts to lose, but still, its so….glaringly obvious with her! I have always thought that Ana Ivanovic was a mirage in the history of tennis, albeit a lovely and beguiling and personable mirage. So much of her game (not unlike Steffi Graf’s game) depends upon her success at getting herself in position to blast forehands, even from locations on the court where backhands are usually hit. In Steffi’s day – and against many players in our own time – it is often possible to do that. But the best modern players simply do not often give an opponent time to run around the forehand, and if one does do, they have the ability to blast a return to the deuce court before Ana (or Stosur, who also depends heavily on this tactic) can move back to her right to cover the open court. One has only to look at Ana’s record against the top players to see how this strategy has failed her. She is 1-8 against Venus, 0-3 against Serena and she was 0-5 against both Clijsters and Henin. 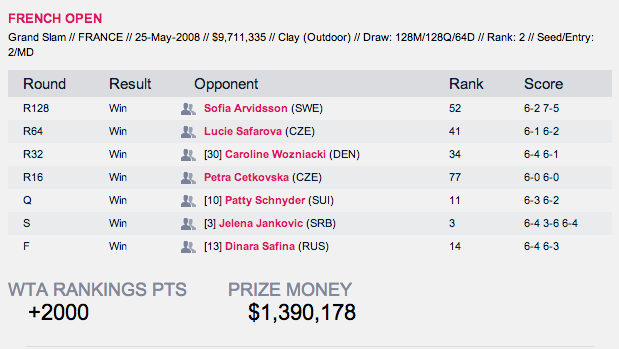 Cumulatively she is 1-21 against the best four players of the past decade. Is it any wonder she has confidence issues? Clay, her best surface, mitigates the flaws in her game to some extent but lovely and talented as she was and is, Ana simply never was as good as many people seem to think she was. Ana doesn’t have the clinicalism,the finish,killer instinct to beat the best in the game. She’s a appallingly poor risk taker and too carefree/hopeful in the important points of the match. Basically playing vs the top players this is a guaranteed loss before the match has started-like Mattek-Sands no matter how well the match is played. She is a sweet and extremely talented player-perhaps a bit too much so for her own good. Too naive to stay at the top and utterly lacking in maturity when it comes to tennis competitiveness. One of the biggest wastes of talents out there alongside Kvitova. Her no 1 stardom along with Wozniacki’s and Safina’s was a temporary fluke which was soon corrected. Nice point about the difficulties in staying at the top vs reaching it. Ana might grow up some now that she can think more for herself without that coach putting that false veil of parental protectiveness. Maybe she can finally come out of that locker room as a mature,composed adult. It says something about her character I guess that she finally decided to dump her coach or does it? It took her all these years until her prime to do it. She seems to be more daring and a bit more ‘out of the box’ which is in turn a bit of a positive. Hopefully she can continue in that direction. Ivanovic, not the worlds best backhand, in fact, I cringe every time she goes to hit one. Serve, I cringe every time she tosses. Forehand, insane. One of the top five forehands in the womens game (of course many of the women have better backhands, myself included :)She seems fit and a decent mover. I heard the body changes were a result of her following the Djokovic diet. I read the book Serve it Up, I am a vegetarian and it seemed pretty unexciting to me. Trust me, if you followed that diet you will be pretty lean too! Anyway, not to dwell on it but she seems borderline too skinny to be a tennis player. These girls like Azarenka, Sharapova, Serena are very strong and solid.